Hillforest remains a tribute to one of the town's leading families. Stepping into the stately Hillforest mansion in Aurora feels like stepping into a scene from a movie. The graceful curved balconies, the large wooden staircase, the rich Victorian carpets – every detail is a history lesson. 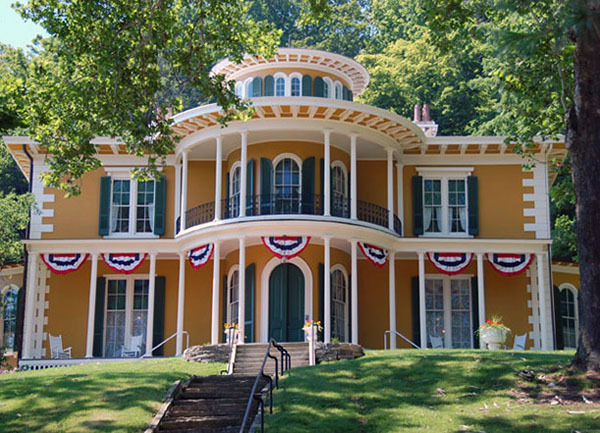 The mustard-yellow home overlooking the Ohio River was created in 1855 by local entrepreneur Thomas Gaff and his family. Gaff and his brother James owned over 35 businesses, not just in Aurora, but all over the United States. Their operations included a distillery, farms, mines, jewelry stores, turnpike and canal construction, as well as two plantations in Louisiana. The Gaffs’ mill in Columbus produced “cerealine,” which may be the first ready-made cereal. Their Crescent Brewing Company remains a popular attraction today. Gaff and his family lived in the mansion from 1855-1891. His daughter sold the home in 1926, and by 1956 it had fallen into disrepair until a local banker joined forces with nine other citizens to purchase and refurbish the home. Hillforest was built in 1855 in the Italian Renaissance architectural style of Isaiah Rogers, one of the country’s first hotel architects. It reopened to the public in 1956, where it was restored to its Victorian grandeur with period furnishings and wall and floor treatments. The porches were reminiscent of the steamboat decks that once passed by, and many of the beautiful furnishings were returned to the house from descendants of the Gaff family. The museum was designated a National Historic Landmark in 1992 and is one of Dearborn County's top tourist attractions today. Rumor has it the house is also haunted. According to local residents, you can spot what looks to be a lit candle moving around the second level at night. The museum offers tours and hosts special exhibitions like themed tea times and group luncheons. These events run from April 2 through December 29 from 1 – 5 p.m. Admission is $6.00 for adults and students over 13, $3.00 for children ages 7 to 13 and free to all children who are 6 and under. While visiting this little river town, you can stop by The Hollywood Casino and Boogie Nights for those twenty-one and over, as well as plenty of local family-friendly restaurants and breweries. Along with a Las Vegas-like casino, The Hollywood Casino has eateries like 99 Hops House and Final Cut. Hops House has brews and basic bar food with a Southern Indiana flavor. If you’re a seafood or steak lover with a little more cash to spend, Final Cut is a good bet for a meal with someone special. Afterward, take the party down to Boogie Nights, a funky nightclub that will have you dancing your way back to the ‘70s and ‘80s. This floating gem not only gives you a taste of the area, but you’re actually dining on the Ohio River. The view is spectacular, the live music will have you in vacation-mode and the food is the freshest in town. Located in downtown Aurora, Combs has the best food in town according to local residents. They have a steak hoagie that some say changes people’s lives forever. The salty garlic bread buns and savory marinara sauce will have you coming back for seconds. Check out a handcrafted specialty at the Gaffs’ Great Crescent Brewery. For information on the area, go to http://visitsoutheastindiana.com.